From the Baldwin County Courthouse, go west on Hancock Street for 2 blocks or 0.2 mile (or the one large block containing Georgia College & State Univ.). Turn right on Clarke Street. Go one large block or 0.2 mile. Turn left onto Highway No. 22 (west) or Montgomery St. Go 5.0 miles. Turn right on Old Monticello Rd. Go 1.1 miles on Old Monticello Rd. Graves, including one upright granite marker, are on the left at the top of hill - a rise of ground 40 ft from road. The hill is just before the driveway at 216 Old Monticello Rd. 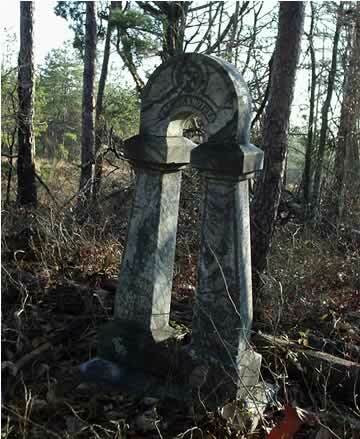 The upright marker is barely visible from Old Monticello Rd. 30-40 graves aligned in rows and marked with bricks, stones or depressions.